Kendal is a very nice town. It had been many years since I last visited, and that had been whilst on holiday with my family, stopping briefly on my way to the lakes. I had somehow forgotten the presence of a large river running through the town and a ruined castle on a hilltop. I drove through the busy centre to John Gerard's house. John, a leading member of the Kendal Buddhist group, had kindly offered me a bed for the night. I was impressed with John's large library of Buddhist books that he holds on behalf of the Kendal Buddhist group and which is affiliated to the Theravada tradition. He had formerly practised within the New Kadampa Tradition and had found this helpful although ultimately rather complex. After sharing a pleasant meal, and discussing the background to the Kendal Buddhist group, we walked into Kendal to the Fellside Centre, on Sepulchre Lane. In a room right at the top of the centre, I met some of the Kendal Buddhist group, including John, Duncan, and Jacquetta and Titus Gomes. Duncan had attended the Kathina ceremony the previous Sunday at Ketumati, and had publicly read a Sutta at this event. Speaking of suttas, it rapidly became apparent that Titus was extremely knowledgeable about the Pali Canon. He was able to regularly quote from appropriate scriptures, and is clearly a valuable asset for the group. Jacquetta had been very helpful in arranging my visit, and was also the founder of the Kendal Group. One of the main topics of conversation was that of Dhamma teacher training. A number of the Kendal group have successfully undertaken a period of training overseen by the Venerable Piyatissa at Ketumati (this is mentioned in the current NBO ezine). This has resulted in them obtaining Dhamma teacher training certificates. Some have also accepted Pali Buddhist names. The training programme is a way of developing skill in teaching within the Theravada tradition. Jacquetta was very interested in how things worked at Amaravati. I explained that although we had considered some sort of more formalised training, we had in the end decided to continue with an informal process. This is largely based on contact and knowledge of lay people's practice by the monastic community and by the Amaravati Lay Association themselves. Those who are considered to have the right approach and background for teaching, or for representing Amaravati in various ways, are encouraged to do so. The fact that lay Dhamma teaching is taking place at Amaravati automatically gives it a legitimacy in the eyes of those who attend. Lay Dhamma teachers teach at some eleven full day or weekend events each year, plus leading the meditation workshops for beginners during the winter months, and leading a regular weekly meditation group. Quite often both lay and ordained teachers contribute to a single event. The approach taken at Amaravati is a simple and organic one, based upon personal relationship and trust, which avoids having to establish and maintain training programmes. However, this approach does depend upon a close connection between lay Dhamma teachers and the Amaravati community, which is not easy to accomplish with remote groups. The following morning, Jacquetta had arranged for me to meet the Universalist Minister, Reverend Celia Cartwright before driving northwards. I met Celia in a beautiful old hall (apparently the old school room) attached to the Church and enjoyed a stimulating discussion around the tenets of Unitarianism and Buddhism. Unitarianism offers an open and non-dogmatic approach to the spiritual life, combined with an enquiring and rational attitude which I find attractive. I noticed a secondhand book stand on my way out of the hall, and one title caught my eye –‘Tall, Dark, and Irresistible’— not a bad description of the hall, I thought: certainly irresistible. Clear Vision Trust is housed within a converted warehouse of red brick, old wooden floors and staircases, and large energy inefficient windows located in Turner Street in Manchester. It was pretty cold and windy at the end of October as I approached the building and I had been surprised at the extensive modernisation that had taken place in Manchester centre since my last visit many years ago. Clear Vision is an FWBO right livelihood venture and the Manchester Buddhist Centre also houses 'Bodywise', providing natural health therapies and yoga, and the 'Earth vegetarian café and juice bar'. The centre as a whole is a good example of the creativity and enterprise I have grown to associate with the FWBO. Clear Vision Trust, as its website states, ‘promotes the understanding of Buddhism through audio-visual media’ and is particulalrly involved with the production of educational material for schools. Munisha took me around the centre, with its range of shrine rooms, disconcertingly Westernised Buddha statues, and striking features like the gleaming copper clad door to the main shrine room. The Clear Vision offices looked like the stereotypical cluttered space of journalists and photographers and contained extensive image libraries and an editing studio. Buddhist educational books and materials are never big sellers, but there is a steady demand from schools for well-produced Buddhist material and information, and also for visits. We discussed many issues, but perhaps the most central was that of authority in Buddhist organisations. The question of how a newcomer judges the quality of a Buddhist organisation. Generally, the possibilities are that one is attracted by the idea of starting to meditate, or by reading about a particular tradition, and subsequently visits one or more groups. Personal experience must be a key litmus test. What is the feel of a place and the people within it? Are they encouraging and open, or dogmatic and excluding? Do they behave with integrity? Does the organisation have healthy links with traditional Buddhist roots and a reputation for honesty and integrity? Gradually trust may be placed in a specific teacher, or in a lineage of teachers within a particular tradition, or in one or more texts or scriptures, or in the community who follow the tradition. In many if not most cases all of these factors will play a role. Finding a good place to practice takes time. And those wishing to develop a Buddhist practice are entitled to expect that Buddhist principles of generosity, kindness and integrity will be fully applied within the organisation. One of the features of UK Buddhism is that many experiments are taking place, both with establishing ‘traditional’ Buddhist models, and in trying new frameworks. Organisations offering Buddhist teachings may sometimes base their authority largely upon the vision and enterprise of a single teacher, without there being a clear lineage or a traditional body of teachings. An obvious feature of UK Buddhism is the number of organisations based upon lay-Buddhist teachers, those who do not follow the Vinaya guidelines, or are not linked with a traditional Sangha, but who have designed frameworks which allow for full-time Buddhists living a normal household life. These are initiatives which should be welcomed, but which come with risks. Asian Buddhists have had some two and half thousand years to try out and hone the traditional Vinaya model with its distinction between householders and monastics and know how this model works, how it fails, and what happens to it over time. This model is still operating today in many Asian countries and has made a good start in the UK over the past 30 years. It has proven itself as a pretty reliable ‘vehicle for awakening’ and the risk of it corrupting the teaching of the Buddha in some basic way is pretty low. It has stood the test of time. Modern Western Buddhist organisations based upon one teacher’s vision, and which have broken from the earliest traditions, carry a higher risk of either distorting the Buddha’s message or of failing in a possibly messy way. They do not have a long track record and we do not really know whether they are firmly based on a true realisation of the Dhamma, or on some other intention. However, they may well identify creative new ways of expressing Buddhist principles and approaches and of broadening the involvement of sincere people in ways of life which support awakening. The eventual outcome of all this is of course largely speculative, we will probably need to wait until the end of this century in order to see if and how ‘Buddhism’ has embedded itself in the West. In the meantime we can work hard at maintaining the integrity of our organisations by acting from wholesome motives and acknowledging and resolving any conflicts or perceptions of misconduct that arise. By the time I reached Ketumati Vihara, it was late, dark, and damp. The vihara is in a small house surrounded by lush shrubbery and trees in a residential area of Oldham. Venerable Piyatissa and three other Sri Lankan monks currently occupy the house. Venerable Piyatissa had generously agreed to my spending one night at the vihara, and after exchanging greetings, the monks arranged some sleeping accommodation in one of the rooms. I mentioned to the Venerable Piyatissa that I had just left a meeting with Joy and James of the Manchester University Buddhist Society (MUBS). Venerable Piyatissa was a leading proponent of the Manchester Buddhist conference that took place in August of this year and which was organised with MUBS. He is enthusiastic about the possibility of organising a similar conference in 2006 and sees this as a way of encouraging support and community between the wide range of Buddhist organisations in the Manchester area. The Ketumati vihara supports both a Sri Lankan Buddhist community in the area, and also a number of Western Buddhists. The Venerable Piyatissa offers a teaching that he has adapted in order to meet the needs and particular problems of English people. He encourages links with schools and pointed to a range of schoolchildren's work, pinned to the wall of the kitchen. Ketumati has good links with Manchester University Buddhist society and Venerable Piyatissa teaches quite regularly at this venue. We discussed the role of the NBO, and I hoped that I or members of the NBO will be able to assist with or contribute to the next Manchester conference. The aim of networking between Buddhist organisations is at the heart of the NBO vision. Venerable Piyatissa hoped to join the NBO subject to discussion with the Ketumati steering committee, and said that if a Manchester regional organisation was established, then this group would join the NBO in place of Ketumati. I realised after we had been talking for some time and that I was quite tired from the long drive and the many meetings that I had taken part in during the day. So, clutching a handful of reading material, kindly offered to me by the Venerable Piyatissa, I retired for the night. The following morning over a lavish breakfast, including a typical and tasty Sri Lankan curry and rice, Venerable Piyatissa described the Kathina ceremony that had taken place the previous Sunday. This had been a well attended and enjoyable day and is the traditional annual offering from lay-people of material for monastic robes and other requisites. One of the readings on the day had been given by a member of the Kendal group who I planned to visit later in the day. The traditional monastic Sangha is governed by the Vinaya framework. This describes a symbiotic relationship between householder and monastic. The monastic community has the responsibility for teaching and maintaining the Buddha Dharma and for demonstrating and living a virtuous lifestyle, whilst the householder practices generosity and bhavana by supporting the monastic Sangha. Although no organisational framework is perfect, the monastic Sangha has managed to survive and flourish for around two and a half millennia. To stand the test of time in this way, it must meet a basic need. After further discussion I thanked Venerable Piyatissa and the Sangha for their hospitality and drove into Manchester on a wet Tuesday morning to meet Munisha from ClearVision. Manchester is a large city, and Manchester University campus sprawls across and along the Oxford Road taking in a shopping mall and several large buildings. Apparently it is the largest campus in Europe. I got a little lost after parking in the Aquatic Centre, but eventually found the student union and after a few minutes met Joy Bose, a leading member of the Manchester University Buddhist Society (MUBS). After a few more minutes James Conole, the MUBS Chair joined us and we found our way to a Lebanese Falafel Café. MUBS was originally started some years ago by Lance Cousins, who also played a leading role in the Samatha Trust and is a well known Buddhologist. MUBS organises two meetings a week. One on Monday is a practice session led by a Samatha Trust teacher; the other on a Thursday hosts a range of speakers and practitioners from different traditions. Manchester University only provides limited funds to each university society and will only fund one society per religious tradition. This may well be a common practice in higher education institutions and I guess from the perspective of a secular institution this keeps things simple. It does mean, however, that different denominations within a religious or faith tradition may need to work together and an exclusive attitude by one denomination is not appropriate. In practice, groups will only form if there is a demand from interested students, and such students will likely already follow a particular tradition. The MUBS model is a good one; although the Samatha Trust provides meditation teaching, the society does host speakers from other backgrounds and manages a comprehensive web site which lists all other Buddhist groups in the Manchester area. I think this is a model for University Buddhist societies that the NBO would want to support as good practice. We discussed the recent Manchester Buddhist Conference. Given that it was held in August, it had been well attended, especially by monastics and other representatives of local groups. Hopefully a conference will take place in 2007, with Venerable Piyatissa from Ketumati playing a leading role. Both Joy and James did not expect to be able to put much energy into MUBS next year; James is undertaking practice in a hospital and Joy will have completed his doctorate. Continuity for University Societies is a well-known problem and possibly one that the NBO can help with in some way. Many thanks to Joy, James, and MUBS for their hospitality. At around mid-morning on a sunny November Monday, I arrived at The Buddhist House in Narborough. This houses the Amida Order, following Pureland Buddhism. Amida Trust, set up in 1996, is the charity sponsoring the Amida Order and there are local Amida groups in various locations in the UK, a retreat centre in France and projects and centres in various parts of the world, including Bosnia, Africa, Hawaii and India. I appreciated a cup of coffee after driving for some two hours, and a pleasant discussion with Susthama, shortly to depart for Hawaii (and with freshly shaven head!). A little later I met Caroline (Prasada) and David Brazier (Dharmavidya). David and Caroline established the Amida Order nearly 10 years ago and, together with Order members, have established an extensive framework of vows and precepts, a constitution, together with an emphasis on social engagement. The various frameworks are all to be found on the Amida website (see below). David and Caroline have supported the NBO for many years. They are firm believers in the need to network with other Buddhist organisations and are of the opinion that different Buddhist organisations all have something to offer. Individuals tend to pick what they need from the different organisations. This is perhaps the Buddhist equivalent of shopping at Tescos, where one can choose exotic produce from many different parts of the world. Those living in the UK have the advantage, and perhaps the difficulty, in being able to choose between a rich variety of Buddhist traditions. Although these traditions are from many different parts of the world and have all arisen from a trajectory which traces itself back to the Buddha, they have tended to diverge in various ways, as they evolved to fit within their particular cultural context. Transplanting traditions that adapted to conditions in Tibet or China, or medieval Japan or Burma, to the UK is bound to appear disconcerting to someone who might have obtained a much simpler view of Buddhism from one or two books. In many cases, if not all, the ‘feel’ of an organisation as exemplified by its members and leaders is what determines a sense of comfort and whether someone stays, rather than particular doctrines. Certainly there is a welcoming and relaxed feeling to the Buddhist House and evidence of many projects underway. David said that it is the availability of volunteers that is the determining factor in what gets done, rather than funds, although covering expenditure is obviously important. The Pureland tradition that David and Caroline have adopted is challenging to a Buddhist more familiar with ‘mainstream Buddhist’ approaches. Pureland emphasises belief and devotion to Amitabha Buddha as the only way possible to follow Buddhism in this degenerate age. This is an approach based on ‘other power’ rather than the idea that each of us has some control over our spiritual path, which is characterised as ‘self-power’. A full exploration of this is outside the scope of my blog, but I find it interesting to consider other approaches to Buddhism if only to clarify what my own practice is all about. Fortified with coffee, biscuits and wholesome discussion, I headed northwards to Manchester where I planned a number of meetings. 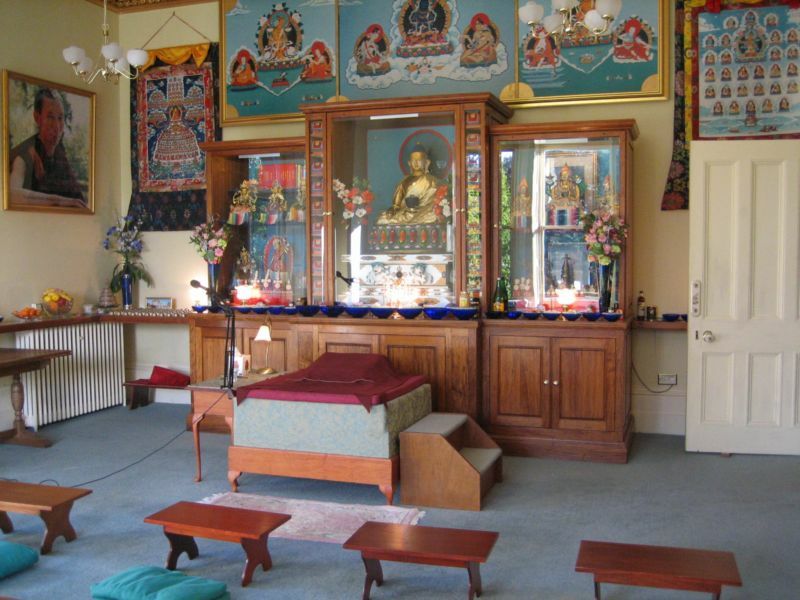 The Tara Centre is a retreat and meditation centre in the New Kadampa Tradition (NKT). It is based in a large grade two listed Victorian Mansion with some seventy rooms and large grounds near Derby. I had arranged to meet with Venerable Kelsang Khyenrab the resident teacher and NKT Spiritual director for the UK. It was a Monday afternoon in early October and the balmy autumn was gradually getting wetter and cooler. On arriving, I was greeted by friendly and efficient members of the community and shown to a room in the Barn Retreat annexe where I deposited my laptop and bag. The Barn has six rooms available on a bed and breakfast basis and appears to be very popular. Ven. Khyenrab had generously offered me the use of a room for the night. I met Ven. Khyenrab later and we talked for a while in the World Peace Café, a comfortable room in the main house which is popular with local people and ‘passing trade’. Indeed, Ven. Khyenrab mentioned that it had resulted in a significant flow of funds into the Centre. He also mentioned that the NKT were building international ‘World Peace’ hotels which functioned as a normal hotel but with the benefit of a shrine room and meditation teaching. The absence of alcohol and loud entertainment attracts those who appreciated a quiet and peaceful atmosphere. Ven. Khyenrab then showed me around the extensive grounds, and the site for a future new temple, funds permitting. As a supporter of the Theravada Forest Sangha, (who follow the traditional Vinaya), I was interested in the nature of NKT ordination and vows. I asked Ven. Khyenrab whether he followed the Vinaya precepts and he replied that he followed the Lam Rim framework originally written by Atisha in the early Middle ages. At this time Atisha had been invited to Tibet from India and produced a structured summary of Buddhist doctrine that became known as the Lam Rim. This subsequently formed the basis for the Kadampa tradition. Some followers of Lam Rim keep to the Vinaya framework whilst others, including the NKT, simply follow Lam Rim and vows which extend the five lay precepts. Some in the Tara community follow pratimoksha and Bodhisatva vows and a celibate lifestyle. Ven. Khyenrab described some of the past difficulties that the NKT had experienced; the Dorje Shugden dispute with the Dalai Lama and problems with Tibetan groups who viewed the NKT with distrust and antagonism. Such problems were acute about ten years back but have subsided to some extent since then, although the NKT still tend to be viewed with disquiet in some quarters today. Apart from the founder and Spiritual Director of the NKT, Venerable Geshe Kelsang Gyatso, almost no senior member of the NKT is Tibetan. Ven. Khyenrab showed me an internal NKT document describing moral guidelines for senior NKT members. Such guidelines are essential for maintaining the integrity of any organisation (and are also to be found in great detail in the Vinaya). Reading the booklet later in my room I found that it outlined processes for dealing with possible misdeeds of senior members who may, for example, have misappropriated funds, broke their vows, left the NKT tradition, or disseminated non-NKT teachings. Coincidentally, someone remarked to me over the evening meal that they were uncomfortable that there seemed to be disapproval of non-NKT reading material, and that she was going to read such ‘contraband’ anyway. The fact is that Buddhists often like to read books and the internet provides an incredible array of Buddhist material; some of it valuable. It is unlikely that any curious and intelligent Buddhist can be prevented from accessing such material. And any attempt just creates a sort of ‘big-brother’ atmosphere. Perhaps it is better to encourage Buddhists to develop their powers of discrimination to determine which books are useful and which are not. Venerable Khyenrab assured me later that ‘it's only our public areas that are kept free of other books so visitors are clear where we're coming from. They can quickly see what we follow. No-one here is stopped from reading what they like’. We discussed some areas of Buddhist etiquette – areas where tension can arise between different traditions. Ven Khyenrab agreed that Buddhist groups in Universities and elsewhere should be clear about their affiliation. This has been a bone of contention, that a University Buddhist Society can actually be exclusively NKT (or some other tradition) without identifying itself as such. Ven. Khyenrab appreciated the information circulated from the NBO, but was not sure that the aims of the NBO were very clear. He welcomed a rewrite of the NBO constitution to clarify NBO objectives. At the moment he found that could not justify spending much time on NBO activity particularly when weighed against his many teaching and other responsibilities. Later that evening Ven. Khyenrab led a Teacher Training Programme meeting. This sits alongside the general and foundation programme, which provide structured training in all aspects of the New Kadampa Tradition and eventually lead towards becoming a qualified NKT Dharma teacher. The advanced programmes are long and intensive, include examinations, and all programmes are based upon Geshe Kelsang’s works. Normally those on the teacher training course will be resident at the centre. Other activities hosted at the centre include school visits, art courses, holiday courses, empowerment events and retreats. The centre appears a very busy, efficient, and enterprising establishment. The traffic in Oxford is busy and slow, so it was later then planned that I arrived at Thrangu House at 42 Magdalen Road, Oxford. I met Kathy Eason, the Secretary, Lama Wangyal, the resident Lama, and Stuart Tett, the Treasurer. Thrangu House came about through the activity of Khenchen Thrangu Rinpoche in 1979 when he first came to England. Over the next few years a number of houses were used for the growing community, culminating in the present location in Magdalen Road with its large and attractive shrine room. The house and shrine room host a range of activities including meditation teaching, Chenrezig Puja and Tibetan Healing exercises. Over a cup of tea, I described the history of the NBO and discussed my role. Lama Wangyal, Kathy and Stuart were not familiar with the NBO. Like all of the organizations that I have visited, their focus is on running a successful centre. Lama Wangyal mentioned a leaky roof and hoped that the Faith Communities Capacity Building Fund offered by the government might help with this. Information about the Capacity Building Fund is available from the government website and the NBO has also circulated this information to members. However, the word ‘building’ included in the title is misleading; the funds are not intended to improve the physical integrity of temples and houses, but to improve administration processes and ‘service take up’, to use Civil Service jargon. Lama Wangyal was interested in the role of the NBO in bringing groups together, but also wondered whether exposure to too broad a range of Buddhist teachings might lead to confusion. For example, such teachings as impermanence were very deep and required focus and practice to penetrate. Lama Wangyal emphasised the practical nature of his teaching and Thrangu House. These were focused on generating happiness for people and helping with their lives and not on committee meetings. He asked in what way the NBO could directly help Thrangu House. I explained that the NBO offered publicity channels through its website and had helped organise events. It also provided information from various sources to its members. The NBO is not static but has evolved and adjusted its activities over the 12 or so years that it has existed. The NBO is open to suggestions for change and for greater involvement with its members, but any activity does depend upon volunteers and resources being available. Yesterday, the 22nd of August, I visited the London Buddhist Vihara (LBV) at Chiswick. I was introduced to the Venerable Seelawimala, the current deputy head of the LBV, and then met with Richard Jones a prominent lay-supporter of the Vihara. The LBV is a popular centre for Sri Lankan Buddhists and also regularly attracts up to forty lay western Buddhists for meditation practice and teaching events. There is a synergy between the Sri Lankan Buddhist community and their deep understanding of, and support for, the monastics, and western ‘convert’ interest in learning about and practising Buddhist meditation. The Vihara contains a large Shrine hall, a meeting room, and a library, and offers a wide range of classes and courses. Support is provided for wedding blessings and funeral service. Visits to the sick and needy at home or in hospital can also be arranged. Facilities are also available for schools and educational groups to visit the Vihara by prior arrangement. John observed that the teaching from the resident Bhikkus had been excellent and had drawn in a lot of support. It was unfortunate that Venerable Vajiragnana (Venerable Pandith M. Vajiragnana Nayaka Mahathera in full), who had been such a force in establishing the current Vihara, was very unwell at present. The LBV had been a member of the NBO some years ago, but it had proved difficult to find a person with the time and interest to continue the association. The LBV had also questioned the benefits of NBO membership. (Richard had memories of lengthy haggling over the minutiae of an earlier NBO constitution). I agreed that the NBO did need additional active members, but pointed out that the degree of involvement could vary and in my opinion this was ok. Inevitably not all members are able to commit the same level of energy to voluntary bodies such as the NBO. I explained that the NBO did offer many benefits. We now had an online newsletter and we welcomed contributions. Hopefully the newsletter would be able to explore some of the areas of potential misunderstanding between different UK Buddhist organisations. We were also able to channel consultation requests between our members. At the moment, and this may be temporary, there are quite a few requests for a Buddhist ‘voice’ or view on various matters. We also discussed the possible regionalisation of the NBO. This is just an idea at present and remains to be properly described and discussed by the membership, but would see annual UK regional meetings supported by the NBO in partnership with local umbrella groups. Each region tends to have a similar mix of Buddhist organisations as local groups and so represents a microcosm of the national picture. In addition, the NBO would run a national AGM, as now, to which member organisations were invited. The advantages of this model would be easier access for local groups to a local ‘conference’ and support for networking between regional groups. Effectively it would represent a decentralised NBO and greater support for ‘grassroots' Buddhism and local initiatives. The NBO could bring a national perspective to regional meetings, provide publicity, and support the flow of information between members, and between members and non-Buddhist organisations. The NBO is also particularly useful in identifying specific issues which affect many or all UK Buddhist groups and in helping to respond to ‘scandals’ or distorted media or public perceptions of Buddhism. Such material could include negative or ill-informed newspaper articles, anonymous attacks on Buddhist groups with the intent or side-effect of bringing UK Buddhism into disrepute, and poorly informed views of Buddhism from within other faith groups. There is a lot more that the NBO could do, given enough support and resources. 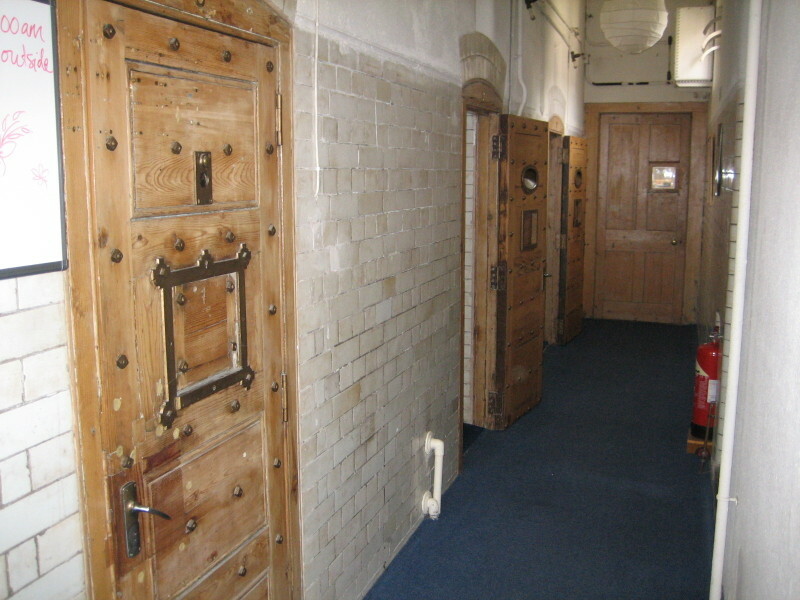 London's Jamyang Buddhist Centre is housed in a converted Victorian Courthouse five minutes from Kennington Underground. The fascinating story of the transformation of a place of judgment and incarceration into a Buddhist centre teaching compassion and liberation is also described on the web site. I had come to meet Jane Sill, Jamyang’s NBO representative on Tuesday the 15th August, but due to an email mix up, found myself drinking a peppermint tea in the café and wondering who to talk to. Fortunately and to my great surprise, an ex-work colleague, John Bonnell, who I had not seen for about five years, appeared, led me to the Jamyang offices, and introduced me to Di Carroll, the Director. We sat in the courtyard and discussed some of the issues facing Jamyang and the NBO. Jamyang has good relationships with the local community and the Council, and other Buddhist organizations, and is well known in UK Buddhism. It hosts a great number of activities, including meditation teaching, open days, a range of classes on many aspects of Tibetan Buddhism, special events on themes such as ‘Dying Well’, and community activities such as sponsored walks and Healthy Cooking Workshops. The centre is very welcoming, and includes a library, shrine room, Courtyard Café (currently closed), a large meeting room for hire, and limited accommodation. Generally speaking, Di thought that Jamyang functioned very well. Perhaps one area that could improve was publicity, especially in the local area; Jamyang has a lot to offer and although many local people attend, this could be still greater. Jamyang is a member of the Foundation for the preservation of the Mahayana Tradition (FPMT) and follows the Gelugpa tradition as taught by the founder, Lama Thubten Yeshe. Di was not very familiar with the NBO and we discussed its role as neutral information and networking ‘hub’ between Buddhist organizations in the UK. Not all NBO members are entirely comfortable with every other member on the NBO ‘hub’, but maintaining dialogue between groups was a core purpose of the NBO. The alternative is to reject certain groups and to have a much more selective membership. This might be required at some point, but leads to a more polarized and sectarian situation: and also a more complex situation. I think we should be aware that Buddhism in the UK is relatively new and still evolving. The situation is not a static one. Groups are changing and redefining themselves. Especially at such a time, interaction between groups is to be encouraged so that good practice can be communicated and less helpful practices identified at an early stage. After our discussion I was fortunate to meet Geshe Tashi Tsering, Jamyang’s resident teaching and to share a meal with him and the Jamyang workers and volunteers. This, the first conference of its kind in Manchester, was organised by the Manchester University Buddhist Society (MUBS) and led by an organising committee comprising the Venerable Piyatissa (Ketumati Buddhist Temple) and the Venerable Miao Di (Fo Guan Shan Temple), together with Joy Bose, James Conole, Dennis Khong and Cathleen Liu of MUBS. The venue for the day was the Fo Guan Shan Temple, a spacious Victorian building which had previously been a library. The organisation for the day had included a comprehensive web site, invitations to a wide range of Buddhists groups in the Manchester region and a detailed programme. The event was attended by around forty participants, notably including some eleven monastics of various traditions. There were representatives from Ketumati, Manchester Buddhist Centre, Manchester Centre for Buddhist Meditation, Saraniya Dhamma Meditation Centre, Vairochana Buddhist Centre, Wat Chareon Bhavana, and Rochdale Zen Retreat. There were some valuable talks, including ‘The heart of monastic practice’ from Reverend Master Bonati from the Order of Buddhist Contemplatives, talks on Buddhism in Higher Education; Counselling, Psychotherapy and Buddhism, and care for the dying. The day finished with discussion groups examining Buddhists as a community. The great majority of the participants expressed their thanks for an opportunity to meet and talk with practitioners from different traditions. James Conole in his survey of ‘what students want from a Buddhist Society’, mentioned the importance of the social aspect. Students not only want to learn about and practice Buddhism, but also to meet with other like-minded people. Some of the problems faced by university Buddhist societies were mentioned. In particular, the problems in maintaining continuity with a constantly changing student population and in gaining enough volunteers. The issue of ‘neutrality’ was also raised. University Buddhist societies are generally (and ought to be) a pathway to all mainstream Buddhist traditions. The need for lay-people, in particular, to meet with other lay-Buddhists was a theme that was repeated throughout the day. Additionally, the Rev Master Bonati also emphasised the need to practice diligently within a tradition in order to make progress as a Buddhist. The Venerable Piyatissa closed the day with a wish to continue with an annual Manchester Buddhist conference. The beginning of August 2007 was suggested as a target for the next conference. The NBO is very supportive of such regional events which create fellowship between Buddhist traditions, and would be enthusiastic about helping to organise and publicise similar events in Manchester or other areas of the UK. From this comprehensive site, there are links to all groups in the Manchester area. Mindfulness Practice: Is Sila Irrelevant? Buddhist Action Day or Action Month? What is the best Buddhist tradition?